This landed in our inbox on Sunday 11th December. Admirable speed, given the Durban meeting had only just finished. As the climate talks in Durban concluded tonight with a groundbreaking establishment of the Durban Platform to negotiate a new global agreement by 2015, the world continues on a pathway of over 3°C warming with likely extremely severe impacts. The agreement in Durban to establish a new body to negotiate a global agreement (Ad Hoc Working Group on the Durban Platform for Enhanced Action) by 2015 represents a major step forward. However, the agreement will not immediately affect the emissions outlook for 2020 and has postponed decisions on further emission reductions. Catching up on this postponed action will be increasingly costly. The Climate Action Tracker estimates that global mean warming would reach about 3.5°C by 2100 with the current reduction proposals on the table. They are definitely insufficient to limit temperature increase to 2°C. 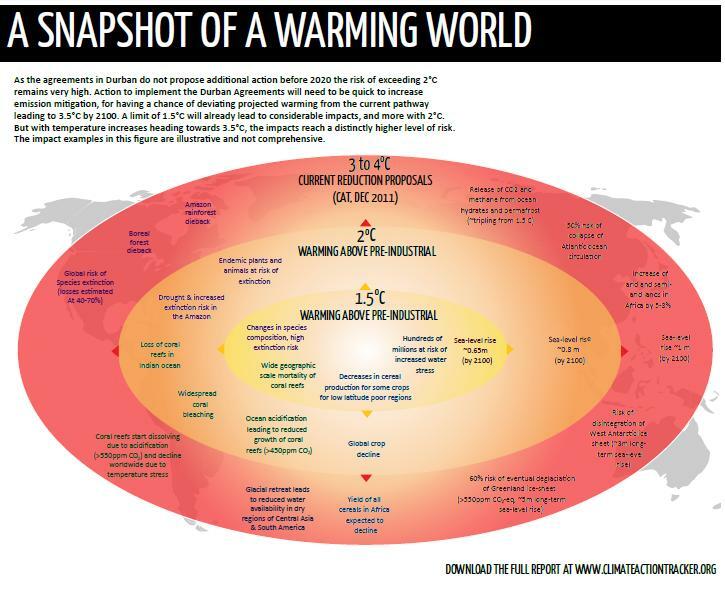 A depiction of the types of impacts likely from 1.5°C of warming, through 2°C and 3-4°C is attached at the bottom of the page. The costs for adaptation and the residual damages from climate change will increase rapidly with warming. Approximate estimates indicate that the most extreme costs will be felt in West Africa and South Asia, with residual damage of 3.5% of regional GDP for 2°C warming and 5-6% for 3°C warming. With a 2°C warming, adaptation costs would be half those associated with a 3°C temperature rise. The Climate Action Tracker is an independent science-based assessment, which tracks the emission commitments and actions of countries. The website provides an up-to-date assessment of individual national pledges to reduce their greenhouse gas emissions.